This hits very close to home for those of us who have either been Red Cross or Red Crescent volunteers, or have worked alongside them as disaster relief volunteers for other organizations, in many countries for many different disasters. Unpreventable natural disasters are terrible enough, but we all understand that they occur periodically and skilled people do what needs to be done. Preventable human disasters by amoral dictators and their mindless followers, driven by power and greed, are unconscionable. There is no possible justification for wounding and killing humanitarian workers, especially your own citizens, volunteering at home. Hakam, from all of us: we know the risks you and your loved ones took when you decided to volunteer and we thank you for your service and sacrifice. HOMS (17/9/2011): This is the funeral of the martyr Hakam Al-Siba’i, a Red Crescent volunteer whose ambulance was attacked by security forces on 7th September. He was on his way with the ambulance crew to Bab al-Aldreb during the invasion of the neighborhood and came under fire from security and Shabiha, including snipers, wounding three ambulance crew members and even the patient himself. 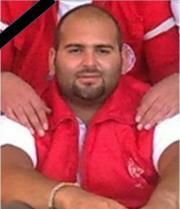 Hakam died of his injuries on 15th September. You can see many other Red Crescent workers and volunteers are attending the funeral in their uniforms. They are doing a brave and priceless job even in peaceful times. They are our heroes. Update: As of 31 December, the Red Crescent has discontinued its services in Homs because of the risk of death and injury to its staff, volunteers, and patients, as well as ongoing destruction of Red Crescent property and harassment by regime forces. There now remains no humanitarian medical organization operating in the city that has borne 40% of all civilian deaths in 2011.